Cute is good. Free is better. 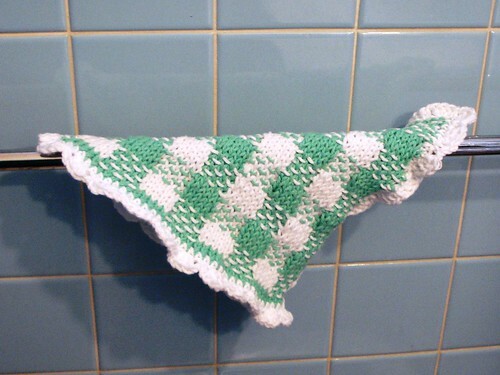 The Gingham Washcloth is now uploaded and free on Ravelry. Sharon - you were the only one who opted to keep gingham in the title and since I decided to keep it as gingham, you win!!! You are the lucky winner of an entire free PicnicKnits pattern. Don't you feel special? The new pattern for the hat will be out soon, so you can opt for that if you want. I'll shoot you an e-mail! I think I need to have a real contest. With swag. I love the word swag. It was a weekend full of stuff. The holidays are good for that. The little dude and I hit a birthday party first thing Saturday morning. And Saturday afternoon was the kids' party at the man's work. Which is always a blast. They really do it up right. Santa was there and everything! Today a friend showed up so I hit an early showing of Twilight - which I loved. (Chris, tell Haley I'll go again!) It was a good weekend. And we have lots of parties and goings on in the next few weeks. The man has Friday off so we will be doing a crazy day of shopping while the boy-os are at school. Tis the season and all that. Hope your holidays are going well so far! Enjoy the free pattern! Oh for the love of pete.